A poor December quarter has driven the local share market to its worst yearly performance since 2011, as the benchmark index hit a two-year low in the final few days of trading for 2018. The S&P/ASX 200 Index ended the quarter 561.2 points, or 9% (excluding dividends) lower at 5,646.4, its worst quarterly performance since September 2011.The ASX200 Accumulated Index which includes dividends returned negative 3.93% over the quarter. 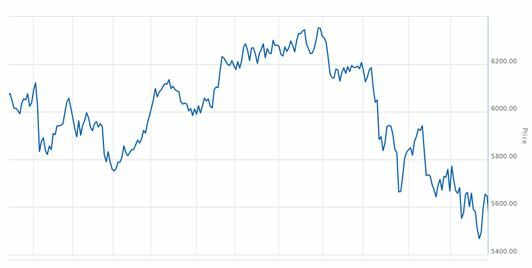 The ASX/200 peaked at 6,351.77 on 30th August, then dropped 884.13 point or 14% by 21st December. January has been positive for the ASX with the market gaining 3.9% for the month. Three of the major banks led the market fall during the quarter as the bank chiefs faced the Banking Royal Commission and shareholders voted down remuneration reports. ANZ slid 13.2% to $24.46, NAB closed 13.4% lower at $24.07 and Westpac declined 10.3% to $25.04. Commonwealth Bank fared much better, rising 1.4% to $72.39 as it avoided a larger sell-off from the other three during mid-November. Energy stocks were also hit as the price of oil continued to tumble. Investors had been hoping OPEC’s proposed production cuts would halt the decline in global crude prices but concerns over slowing demand and increased supply in the United States pushed the commodity into a bear market. Woodside Petroleum led the losses on the local market, falling 18.8% to $31.32 during the quarter. Origin Energy slid 21.7% to $6.47. The government also announced strong measures to curb climbing power prices earlier in the quarter, extending the losses in the sector. It was a poor quarter for global equity markets as economic growth concerns in the US and continued market volatility pushed the Nasdaq into a bear market for the first time since the global financial crisis. Despite falling more than 6% during 2018 and recording its worst yearly performance since 2011, the Australian share market outperformed most other major equity markets around the globe in 2018, although with a lot of volatility. Recent data releases have done little to change our outlook for the economy. Exports continue to trend upwards, supported by additional mining and LNG capacity coming online, while services exports have been aided by the weaker dollar. Business sentiment remains fairly positive, and business investment is expected to support growth through 2019. Household spending remains the weak link in the outlook, held back by anaemic household income growth. BIS Oxford Economics expects GDP to increase by 2.7% in FY19, before moderating to 2.5% in FY20. Global GDP growth is steady at around its trend pace. A key issue for the global economy and financial markets in 2019 will be the degree to which the US Fed and other central banks continue/begin policy tightening. We do not expect central banks in the advanced economies to become notably more aggressive with respect to policy tightening next year. After cutting the cash rate to 1.5% in August 2016, the RBA has held fast for over two years. And although the majority of banks have implemented out-of-cycle increases in their mortgage borrowing rates (to reflect rising funding costs, which are being driven up by monetary tightening in the US and tighter liquidity in some money market segments), mortgage rates remain historically low. In line with other developed economies, inflation in Australia has slowed sharply over the last two years. Spare capacity in the economy is limiting domestic price pressures, and subdued inflation globally and squeezed retail margins are dampening import price rises. Falling oil prices will weigh on headline inflation for the next few quarters. Australia is experiencing structural shifts in the labour market that are weighing on wage rises, including falling unionisation rates, slower productivity growth and a weakening of the link between price rises and labour market performance. Underlying inflation will remain low until we see a sustained increase in wage inflation. The AUD has depreciated against the USD this year, falling 7.6% since the end of 2017. This move largely reflects a general strengthening of the USD against all currencies. As a result, the currency has depreciated by less against the broader basket. We expect a slight appreciation of the AUD as we move into the second half of 2019 and 2020, as momentum in the US economy slows. Growth in employment has been steady over the past few months. While employment growth has slowed compared to 2017, recent growth has been concentrated in full-time employment, which is a positive sign for household labour income. Slack in the labour market remains, but is gradually being absorbed, with the unemployment rate falling to 5%. Wage growth is low, but it is increasing very gradually, and should continue to do so if the unemployment rate remains around its current level. Although Treasurer Morrison announced sweeping income tax changes in his budget for FY18/19, the immediate impact on the government’s fiscal position (and the economy) will be limited – the majority of the cuts are pencilled in for FY23 and beyond, and they have yet to be passed through the Upper and Lower houses. Strong employment growth last year has given the Treasury an income tax windfall, and they now expect to balance the budget in FY20. The downturn in Australian housing conditions accelerated through 2018, driven by consistently larger quarter-on-quarter declines in Sydney and Melbourne together with a reprisal in Perth’s rate of decline and slowing conditions across the remaining capital cities and most regional markets. The year finished with national dwelling values down 4.8%, ranging from an 8.9% fall in Sydney values through to a 9.9% rise in values across regional Tasmania. Most regions of Australia recorded a weaker housing market performance in 2018 relative to 2017. 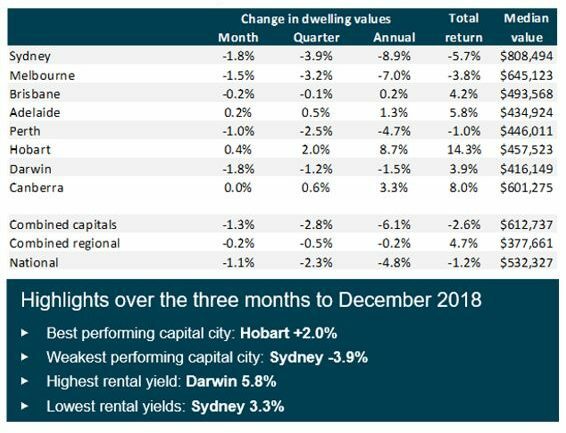 Four of the eight capital cities recorded a decline in dwelling values over the calendar year led by Sydney (-8.9%) and Melbourne (-7.0%), while values were also lower across Perth (-4.7%) and Darwin (-1.5%). The remaining capital cities recorded a rise in values, although conditions weren’t as strong as 2017 with every capital city recording a weakening in the pace of growth or an acceleration in the rate of decline over the year. Although Sydney and Melbourne recorded the weakest conditions, the peak to current declines are much less severe relative to Perth and Darwin where values have been falling since mid-2014. Sydney values are now 11.1% lower relative to the July 2017 peak and Melbourne values are down 7.2% since peaking in November 2017. The downturn has been running much longer in Perth and Darwin, resulting in cumulative falls of 15.6% and 24.5% respectively. At the end of 2018, Sydney values were back to where they were in August 2016, while Melbourne values are back to February 2017 levels. Perth values are back to levels last seen in March 2009 and Darwin dwelling values are at October 2007 levels. While we do expect further falls of probably 5% – 10% in property values over Sydney and Melbourne (following a 10 year run of growth!) it’s hard to see the doomsday scenarios of a further 40% fall eventuating as predicted by some. For this to happen we would need to see a material about face in labour market conditions, a global shock or a material rise in interest rates – none of which seems to be a likely outcome at the moment. Labor’s proposed changes to both capital gains tax (CGT) and negative gearing could easily exacerbate this decline and provide ideal buying opportunities for the long term investor.